It is human nature to assume that the latest severe weather event is part of a pattern of change. But when it comes to tornadoes in the United States, the statistics suggest otherwise. 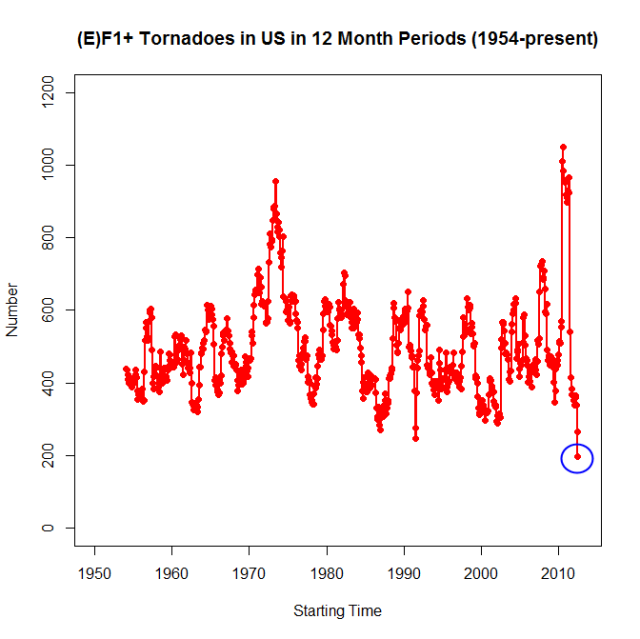 Tornado statistics in the U.S. have been kept since the 1950s. As the population has grown and video cameras have become commonplace, there has been some increase in the total number of tornadoes reported, but it is well known that tornado reports are clustered near where people live. As towns, cities, and roads have expanded, there are more visual sightings of tornadoes which would have gone undetected before. So, while the Moore, Oklahoma tornado of 20 May 2013 was a relatively rare F5 monster, it is normal for these massively destructive tornadoes to occur once in a while, as they have throughout recorded history. If anything, global warming should cause fewer tornadoes to form. The reason is that the wind shear required for tornado formation requires the proximity of COLD air masses next to warm air masses. In fact, most tornado outbreaks in the U.S. are associated with unusually cool weather. In the tropics, where temperatures are warm year round, tornadoes are quite rare.